I kind of hate fireworks. They’re loud, they’re unpredictable, and they involve fire, which is something I like to stay far, far away from. But this week is the Chinese New Year holiday, and the #1 way to celebrate is to light enormous bundles of fireworks, then cheer as they explode. Everyone gets into the activity, including a worrisome number of unsupervised young children, and the whoosh-pop of fireworks is a constant soundtrack here this week, often followed by the shriek of car alarms (I heard the first of them at 6:08am today). Although the government has asked people to cut back on the pyrotechnics, and although there have already been a few accidents, like this one, that would certainly deter me from purchasing any, no one here shows much interest in eliminating them from the New Year celebration. And so I must learn to stop worrying and love the fireworks. Family fun with fireworks directly below my hotel window in Haikou. The place where I’m trying to do this is Hainan, a semitropical island in south China, where I decided to spend the first four days of the weeklong New Year’s holiday. Before even arriving here, though, I had a wonderful fireworks experience that forced me to admit that I can kind of understand why dangerous explosives are the preferred way to celebrate a mid-winter festival. A little before 8:00 on Saturday night—New Year’s Eve—I stared out the window of my Hainan Airlines flight as we ascended from Pudong Airport and began our journey to the island’s capital city of Haikou. The flight attendants had turned out the cabin lights for our takeoff, and the darkness gave me a perfect view of Shanghai below. One after another, so fast my eyes couldn’t follow them all, I could see thousands of pinpricks of light flare up and then vanish—fireworks set off by millions of people anticipating the arrival of the new year, creating a circuit board of celebration across the city. It was amazing; I can’t remember ever being so mesmerized during a flight’s takeoff before, and I was disappointed when the plane climbed above the clouds and the sight disappeared. 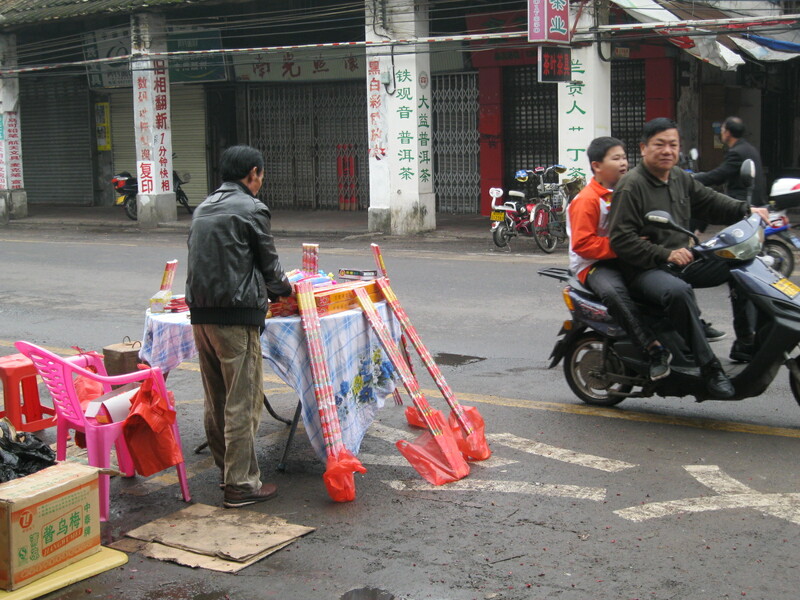 Drive-up firework sales in Haikou; the father and son on the scooter completed a purchase a second before I snapped this photo. 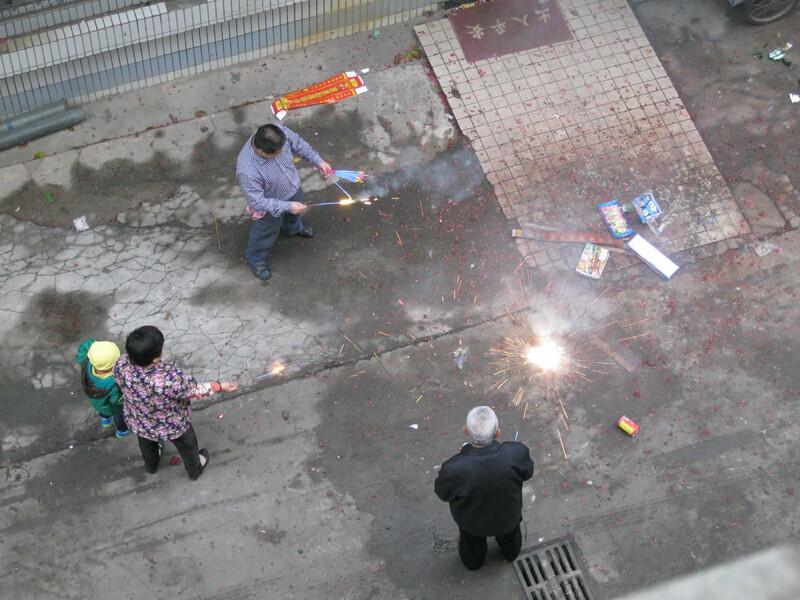 I’ve spent the past two days in Haikou cringing as families set off fireworks directly below the window of my hotel room, and I amused a cab driver greatly when a particularly loud and close explosion sent me diving for cover in the backseat of his taxi. But even though I might never embrace fireworks, I have to admit that Shanghai has never looked as beautiful as it did on Saturday night when I gazed down on a joyful city from above.